Do you ever have those jam packed weekends where you had a lot of fun and did a ton of things, but it feels like it went by in 5 seconds? That’s how my weekend was. It was super hot on Saturday, and after running 4 miles, Brock and I hopped on the bikes and went out for a 20 mile ride. It was super fun! We rented a bike for him from a local place in town called The Handlebar, but I think after having as much fun as he did Saturday, we will be buying a bike for him soon which is super exciting! I wish I had thought to take more photos this weekend but I just completely spaced, which is unfortunate. 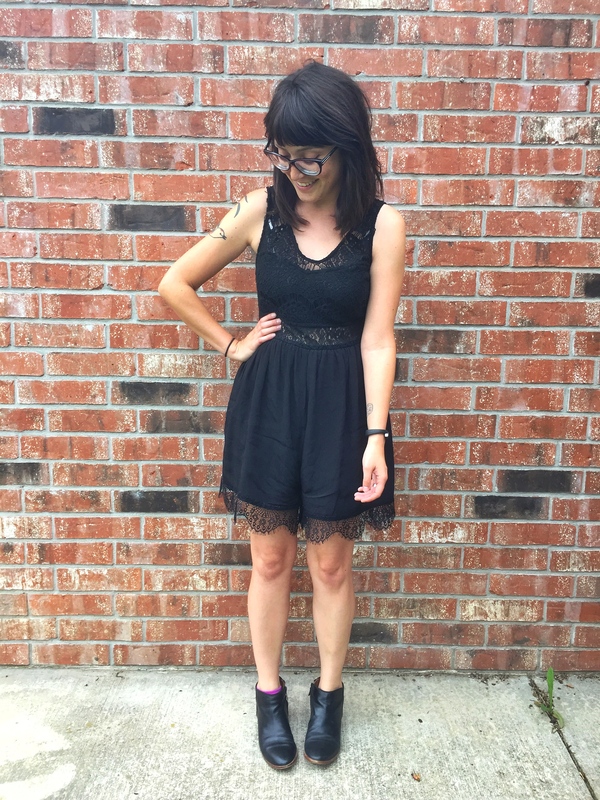 This romper is one of my favorite pieces in my wardrobe right now. Its super comfy and can be super casual or dressy- I wore it to a rehearsal dinner in Austin and it was perfect! Excuse the hair, though…I just recently got my bangs re-trimmed and I’m trying to figure out how to use my hair straightener for loose wavy curls and the struggle is real. How was your weekend? Did you get out any enjoy the sunshine? I hope so! Rompers and jumpsuits are the best! Easy to dress up or down as you show and also showing on my latests posts. The romper is beautiful! ❤ Looks pretty comfy too. Thanks Melissa- glad you got to enjoy the sunshine! 2. OMG in law school during finals I was procrastinating one day and seriously spent like THREE. HOURS. watching YouTube vids of teenaged girls telling me how to curl my hair with my straightener. I felt like such an old lady… but it worked! Go check out YT if you need any help. ooh, i’ve wanted to wear a jumpsuit for so long! I bet you will look super cute, can’t wait to see it! Dude…the hair struggle is awful. I feel like I missed out on some girly gene and then I get annoyed and just throw a hat on. All Black Everything! You look great, happy Monday.